The HS Series master development system is designed to assist in the rapid evaluation and integration of HS Series encoders and decoders. The HS Series uses CipherLinx®, an extremely secure protocol that received a glowing review from the Independent Security Evaluators. This all-inclusive development system contains all of the tools and parts necessary to fully explore the capabilities of the HS Series. 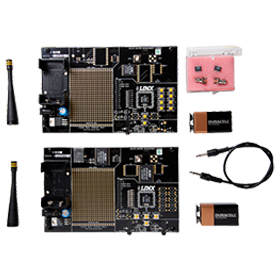 It features two fully assembled development boards for benchmarking and prototyping. On-board Linx RF modules provide a wireless link for basic remote control operation. LR Series RF modules are standard, but ES Series modules are also available. This allows the encoder and decoder to be quickly tested in a wireless environment. A large prototyping area with breakout headers and regulated power supply allows for rapid testing and integration of your own design. In addition to its stand-alone functions, the board can also be connected to a PC via a USB connection. Demonstration software is included which audibly and visually demonstrates the powerful capabilities of the HS Series. The development system also includes antennas, batteries, documentation, connectors and USB cables. Technical support for the kit and all on-board Linx products is included.